The name of Argentine band Cucamonga will not fail to ring a bell with Frank Zappa fans, as it references the Californian suburban city (now called Rancho Cucamonga) where Zappa’s Studio Z was located. Unfortunately, the information available on this quintet – led by guitarist Oscar “Frodo” Peralta, who is also the band’s main composer – is very sparse, and they currently have no active website or social media presence. Their debut album, Alter Huevo, recorded in early 2011 in the northern Argentine city of Santa Fe, was released a year later by AltrOck Productions. Not surprisingly, Zappa is a major influence on Cucamonga’s sound, which comfortably straddles the line between avant-progressive rock and classic jazz-rock/fusion, with liberal doses of humour thrown in as an added bonus. Clearly a bunch of talented and dedicated musicians, their particular brand of music may not be extremely innovative (nor does it claim to be), but it is sure to intrigue the discerning listener, with enough complexity to please the most demanding fans and an endearingly light-hearted attitude to temper the technical dexterity. Though Alter Huevo is mostly instrumental, voices and bursts of laughter add a quirky touch to a few tracks. Warm hints of Latin music are scattered throughout the album, while the accordion – the iconic protagonist of tango music – lends its distinctive Old World flavour to some of the compositions. 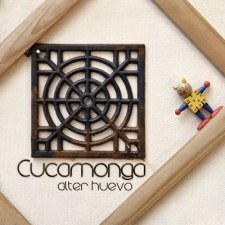 However, Cucamonga’s sound rests on three main instruments – guitar, sax and drums – effectively complemented by keyboards and mallet percussion. With a running time just under 40 minutes, Alter Huevo is a compact, well-balanced album that is easy to enjoy without getting overwhelmed by an excess of notes. Opener “Tetascotch”, the longest track on the album, and the most complex in terms of mood and tempo changes, kicks off with a funny circus-like tune, then takes a more laid-back turn, with all the instruments getting their chance to shine in classic jazz-rock fashion. “El Dengue De La Laguna” continues on the same path, showcasing Julian Macedo’s stellar drumming – propulsive and textural at the same time – while the instrumental interplay often suggests a dialogue without words, with an elegance that hints at vintage Canterbury. “Tu Guaina” and “Variaciones Sobre Tu Hermana” veer towards the Avant end of the spectrum, the latter throwing in some dissonance and moments of rarefied calm enhanced by the cascading tinkle of the mallet percussion. With “Tillana”, Cucamonga tackle a traditional piece of Carnatic music (the classical music of Southern India) originally rearranged by legendary percussionist Trilok Gurtu for his 1993 album Crazy Saints – which, as can be expected, pushes percussion to the forefront, though guitar, sax and piano also play a strong role. “Cerrazón En Al Teyú Cuaré” alternates slow, melancholy moments with sudden surges of power. The short, upbeat “Dominguillo” introduces album closer “Cletalandia”, based on a hilarious radio broadcast about restoring sensuality in marriage – something that would have definitely won Zappa’s seal of approval. Those familiar with Spanish will enjoy reading the text in the CD booklet. Musically speaking, the track is bookended by energetic sections very much in classic jazz-rock style, powered by Adriano Demartini’s groovy bass lines; while the central part, which includes the broadcast, is accompanied by sparse yet expressive sax. In keeping with AltrOck’s reputation for stylishly packaged products, Alter Huevo comes with a nicely illustrated booklet (courtesy of the label’s resident graphic artist, the multi-talented Paolo Ske Botta) that successfully combines elegance and whimsy. Udi Koomran’s experienced mastering guarantees excellent sound quality, emphasizing Cucamonga’s varied instrumentation and the impressive skill of the players. Lovers of eclectic jazz-rock with a pinch of avant-garde and world-music spice (as offered by bands as AltrOck’s own Calomito or MoonJune’s Slivovitz) will appreciate this solid, classy offering by an interesting new band. However, it would be a good idea if Cucamonga took a more active role in promoting their music on the Web, which in this day and age is nothing short of indispensable.